Here are some snazzy birthday facts about 25th of November 1943 that no one tells you about. Don’t wait a minute longer and jump in using the content links below. Average read time of 10 minutes. Enjoy! What day was my birthday Nov 25, 1943? November 25, 1943 was a Thursday and it was the 329th day of the year 1943. It was the 47th Thursday of that year. The next time you can reuse your old 1943 calendar will be in 2021. Both calendars will be exactly the same! This is assuming you are not interested in the dates for Easter and other irregular holidays that are based on a lunisolar calendar. What day is November 25 this year? There are 220 days left before your next birthday. You will be 76 years old when that day comes. There have been 27,539 days from the day you were born up to today. If you’ve been sleeping 8 hours daily since birth, then you have slept a total of 9,180 days or 25.13 years. You spent 33% of your life sleeping. Since night and day always follow each other, there were precisely 932 full moons after you were born up to this day. How many of them did you see? The next full moon that you can see will be on April 19 at 11:14:00 GMT – Friday. Fun stat: Your first one billion seconds (1,000,000,000) happened sometime on August 3, 1975. If a dog named Stasiu - a Rhodesian Ridgeback breed, was born on the same date as you then it will be 393 dog years old today. A dog’s first human year is equal to 15 dog years. Dogs age differently depending on breed and size. When you reach the age of 6 Stasiu will be 45 dog years old. From that point forward a large-sized dog like Stasiu will age 5-6 dog years for every human year. View the complete list of November 25 celebrity birthdays. Who are the famous November 25 birthdays? Here’s a short list of famous people in history who were born on Nov 25. View the complete list of November 25 famous birthdays. What happened on my birthday – Nov 25th? The White Ship sinks in the English Channel, drowning William Adelin, son and heir of Henry I of England. King Ferdinand VI of Spain grants royal protection to the Beaterio de la Compañia de Jesus, now known as the Congregation of the Religious of the Virgin Mary. French and Indian War: British forces capture Fort Duquesne from French control. Later, Fort Pitt will be built nearby and grow into modern Pittsburgh. Partitions of Poland: Stanisław August Poniatowski, the last king of independent Poland, is forced to abdicate and is exiled to Russia. A cyclone slams India with high winds and a 40-foot storm surge, destroying the port city of Coringa (which has never been completely rebuilt). The storm wave sweeps inland, taking with it 20,000 ships and thousands of people. An estimated 300,000 deaths result from the disaster. American Indian Wars: In retaliation for the American defeat at the Battle of the Little Bighorn, United States Army troops sack Chief Dull Knife’s sleeping Cheyenne village at the headwaters of the Powder River. Red Scare: The “Hollywood Ten” are blacklisted by Hollywood movie studios. Agatha Christie’s murder-mystery play The Mousetrap opens at the Ambassadors Theatre in London. It will become the longest continuously-running play in history. Iran–Contra affair: U.S. Attorney General Edwin Meese announces that profits from covert weapons sales to Iran were illegally diverted to the anti-communist Contra rebels in Nicaragua. The King Fahd Causeway is officially opened in the Persian Gulf. View the complete list of November 25 historical events. Curious about this Creme-filled Choco? This is a party item you can activate and send to your friends when you play the free game Jump Birthday Party. It’s a fun and easy-to-play mobile game for all ages. Get free 1,000 gold coins when you download today! What does my birthday November 25, 1943 mean? 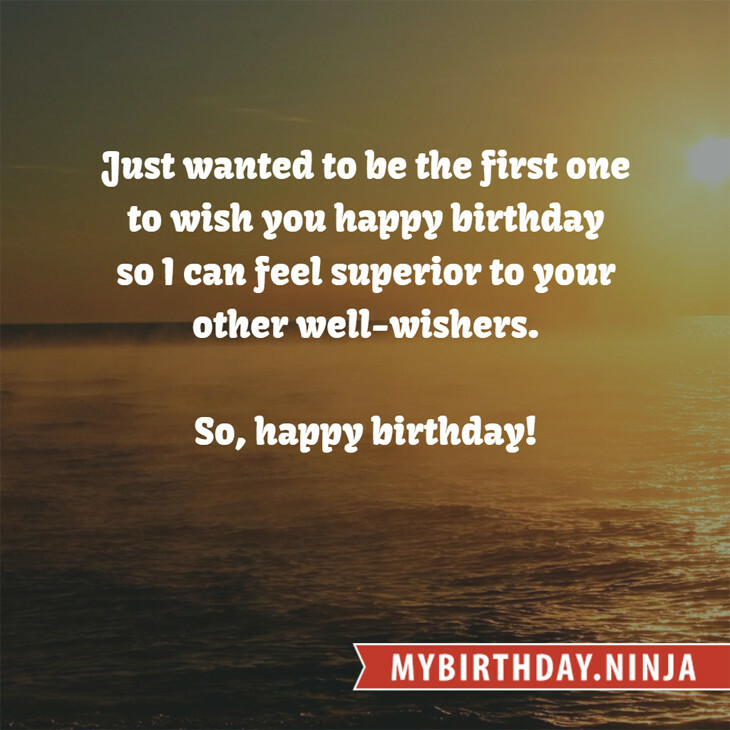 Your birthday numbers 11, 25, and 1943 reveal that your Life Path number is 8. It represents experience, authority and endeavour. You are gifted with natural leadership and the capacity to accumulate great wealth. The following celebrities also have the same life path number: Vincent Winter, Gail Porter, Bertrand Tavernier, Rosanna DeSoto, Myleene Klass, Shruti Haasan, Marc Broussard, Varun Dhawan, Stephanie McIntosh, Mario Salieri. 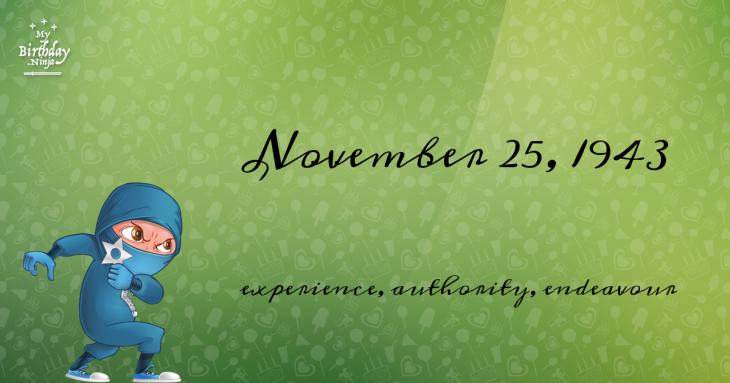 What is the birthday horoscope for Nov 25, 1943? The Western zodiac or sun sign of a person born on November 25 is Sagittarius ♐ (The Archer) – a mutable sign with Fire as Western element. The ruling planet is Jupiter – the planet of luck and expansion. According to the ancient art of Chinese astrology (or Eastern zodiac), Sheep is the mythical animal and Water is the Eastern element of a person born on November 25, 1943. What is the birthstone for November 25? Topaz is the modern birthstone for the month of November while Pearl is the mystical birth stone (based on Tibetan origin). The zodiac gemstone for Sagittarius is topaz. Lastly, the birthday stone for the day of the week ‘Thursday’ is sapphire. Fun fact: The birth flower for 25th November 1943 is Chrysanthemum for loveliness. What is the Love Match for Nov 25, 1943? When it comes to love and relationship, you are most compatible with a person born on October 15, 1917. You have a Love Match compatibility score of +156. Imagine being in love with your soul mate. On the negative side, you are most incompatible with a person born on March 3, 1965. Your incompatibility score is -159. You’ll be like a cat and a dog on a love-hate relationship. Arf-arf, I want to bite you. Meow-meow, stay away from me! What is a good birthday trivia for November 25? I do not know how you feel about this, but you were a male ♂ in your last earthly incarnation. You were born somewhere around the territory of Wales approximately on 950. Your profession was entertainer, musician, poet, temple-dancer. What is the popular baby name on 25 Nov 1943? What’s your bizarre Florida Man story? The #FloridaManChallenge is breaking the Internet and social media. Some crazy men, women, or creatures from the Sunshine State are making headlines every day of the year including your birthday. Try this fun exercise. Pick your search engine of choice and type in “florida man November 25” and see what kind of wild news headline you will get. This viral craze started in 2013 and gets resurrected now and then. The latest was from Tumblr and found its way to Twitter. As they say, the rest is history. Here’s a quick list of all the fun birthday facts about November 25, 1943. Celebrities, famous birthdays, historical events, and past life were excluded. Try another birth date of someone you know or try the birthday of these celebrities: October 26, 1945 – Jaclyn Smith, American actress and producer; July 26, 1922 – Jim Foglesong, American record producer (d. 2013); March 27, 1934 – Peter Schamoni, German director, producer, and screenwriter (d. 2011).